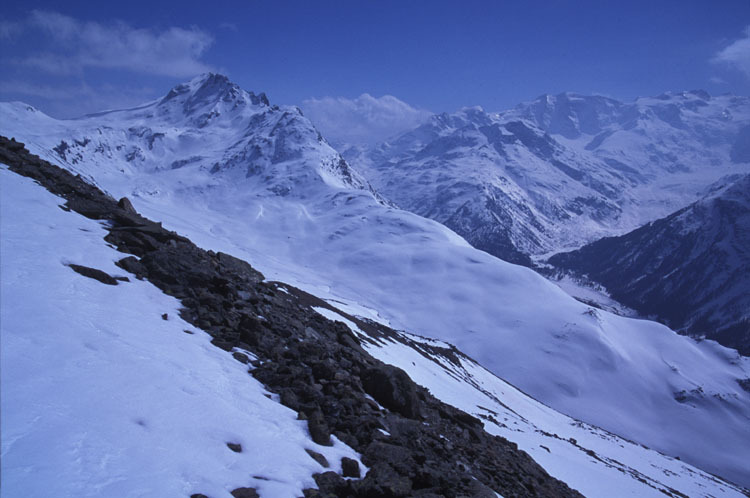 This is the view from a spot almost all the way up Piz Languard. I didn't see any other human tracks up this high but I did see a couple big deer on the way down. I didn't go any higher because there were dense clouds higher up so I wouldn't be able to see much and I wasn't really on a trail. Other people had climbed as high as the upper cable car station mentioned in the caption of the chair lift picture. The chair lift station was built on a wide (order 100 m) ledge and the snow on the entire ledge was not only deep but also weak so I punched through with every step and in places I was punching through up to my thigh for a number of steps in a row. It would have been a much easier hike in the summer, but the snow made it more fun.